Privacy (default): Facebook provides privacy on three basic levels. Firstly, public, here everyone can see the posts made by a person. Secondly, friends setting, here the page can be accessed only by the friends of the user. 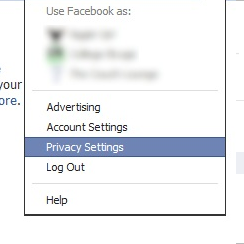 Thirdly, custom setting, here the user is provided a granular approach when it comes to privacy settings of the user. The custom setting can be experimented with by the user. The custom setting helps you to divide the contacts into various groups depending on work, school and college. This is a very useful feature as it helps the user to know the contacts he has. The setting helps the user to control the people who can check the account. The setting also ensures the people who can contact you and otherwise. This setting much like the previous is divided into friend, public and custom. It is up to the discretion of the user as to how they want to use the setting. The feature helps the user to make his account less permissive. The setting is to help the user understand the benefits and advantages of having a facebook account. The setting checks unwanted people from accessing the account of the user. Timeline has been recently introduced on facebook.The feature assures and confirms the people who can put up posts on the timeline of the user. It Also helps the user to understand whose post they want to be tagged in or remove the post altogether. The user can in away detag him in case of any embarrassing post. In case the user chooses the option of no one then the friends of the user have to tag themselves manually. The setting makes working easier for the people when it comes to being tagged or otherwise. By using the application where the user gets to choose his apps, the user can select each of the apps and delete each of the apps separately. The ads setting helps the person the select the ads he would like to publish on his wall. This setting also helps the person to personalize his account. This is almost instant and on spot. The setting also helps in going into the details of one’s own account. The setting helps a person to remove and confirm the thing that he wants to at his own will. The apps are well adjusted to the taste of the user using the account. The setting helps the user to limit the viewership of his page or account. Activating this setting would make using facebook less time consuming. The block option helps the user to remove unwanted friends from their account easily. It also makes it impossible for the blocked person to enter the account of the user. The block is a universal block that helps prevent abusive comments from unwanted people. The people in the blocked list cannot be added to the user’s friend list unless they are removed from the blocked list. About the Author - PrIyAnGsHu is a blogger, internet marketer and a web entrepreneur from India. He generally writes about gadgets and software on his technology blog .